The Artist Summit in early October was truly a unique and memorable experience. Artists from all disciplines and various locations came together in Provincetown for several days to learn, share and inspire each other. 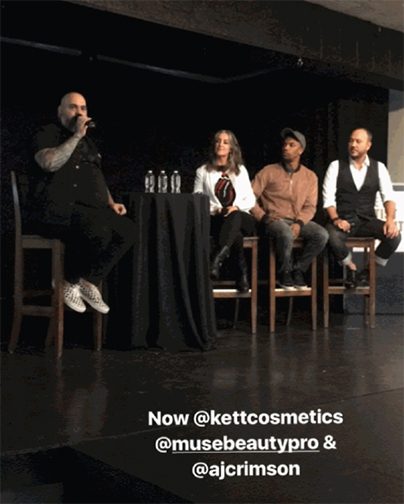 Kett Cosmetics was a proud sponsor of the event and our founder, Sheila McKenna, was a member of the discussion panel, “Me, My Brand and I,” alongside AJ Crimson of AJ Crimson Beauty and Alphonse Wiebelt of Muse Beauty Pro. 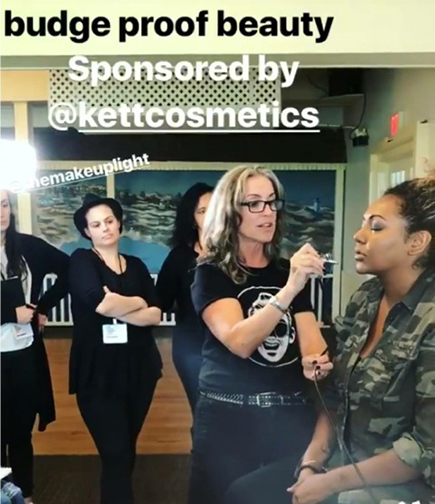 Sheila also led the “Budge Proof Beauty” workshop in which she shared her techniques for how to create long lasting, “budge proof” beauty makeup using both airbrush and traditional methods. The workshop sold out weeks in advance demonstrating that professional artists feel a sense of urgency to learn and master these essential skills in order to advance their careers. If you were unable to make the Artist Summit and are interested in a similar workshop, check out the Kett website for our upcoming schedule or request a private one-on-one session. Other big news: Kett Cosmetics recently introduced the new Kett mini jett. This new, lightweight (less than 1 lb! ), compact compressor is an easy fit in your kit and will not weigh down your “on location” set bag. Additionally, the mini jett is a great choice for artists that may not airbrush on a regular basis but would like the option when the need arises. This super cute addition to the Kett Family offers an alternative to traditional makeup application.